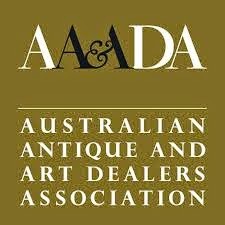 Most of us are familiar with Murano glass ashtrays - those heavy, hand-blown, brightly-coloured glass bowls that were everywhere in the 1960s and are staging a major comeback. Now they sell for anything from $15 £10 - $40 £25 . 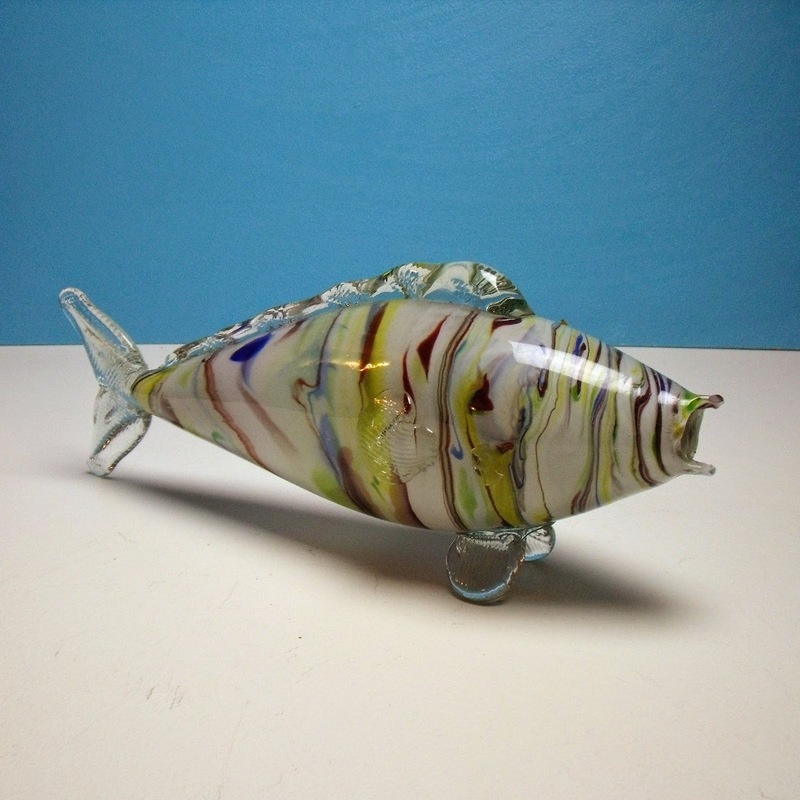 Or perhaps you have a Murano glass fish or clown at home. But these make up just a fraction of the island's production. Murano's glass factories have a long and proud tradition dating back centuries. As with any trade, the glass industry of Murano has seen its ups and downs. The island's current reputation is the result of a glass renaissance that began in the late nineteenth century. The then mayor of the island, Antonio Colleoni, founded a glass museum to showcase the best of the old. At the same time, Antonio Salviati reinvigorated the old glass industry by using the old techniques of ancient glass making that had been lost to Venetian craftsmen. Salviati's new art glass found a ready clientele, and, in 1868, he opened a showroom in Regent's Street. Nine years later, he formed a new company, 'Vetreria Salviati Dott. Antonio', which underwent a bewildering change of names over the years, before eventually becoming Barovier e Toso in 1942. 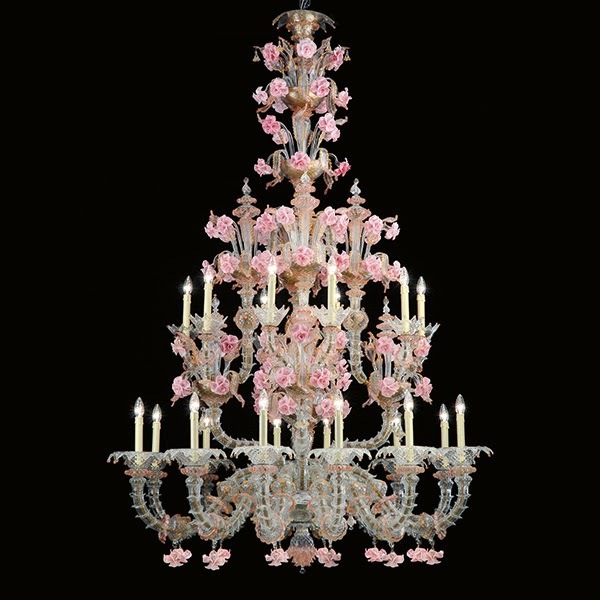 The idea of resurrecting old styles was central to the nineteenth-century applied arts, and Murano glass re-interpreted the old techniques used in sixteenth century Venetian glass. Towards the end of the century, the baton of the avant-garde in glass moved away from Murano. The work of Louis Comfort Tiffany and the French glass makers, like Galle, took centre stage. 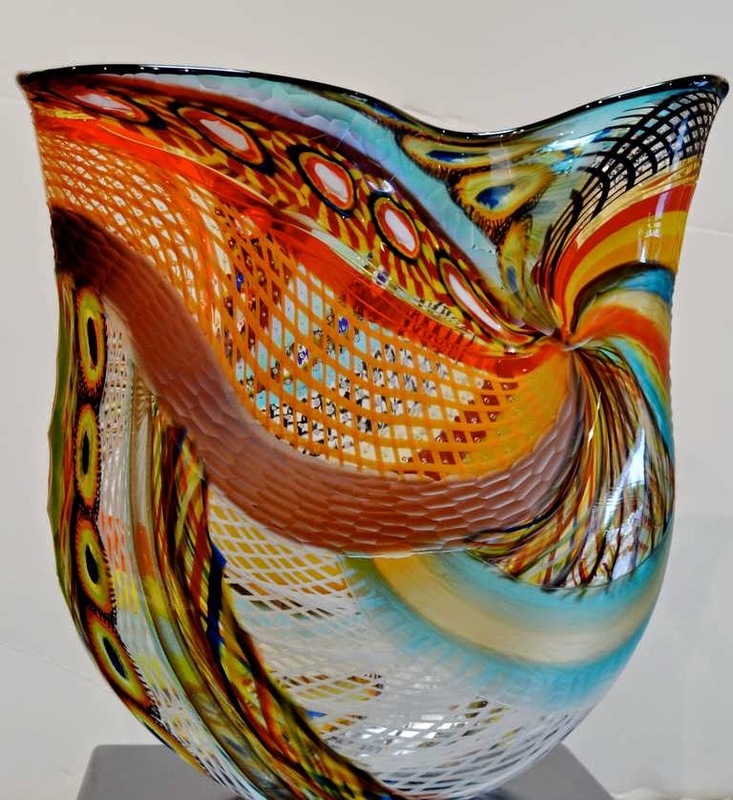 In the 1920s, Murano began to produce truly original glass forms, rather than those drawn from historical styles. Simple, blown, often monochrome glass represented the artistic segment of production. New manufacturers sprang up, in particular Cappelin Venini and Co, founded in 1921 by Giacomo Cappelin (an antiques dealer) and Paolo Venini (a Milanese lawyer). Brand new glass makers were better able to grasp the new trends in glass without any emotional attachment to the old styles, and Paulo Venini was keen to forge a new style for Italian glass. Venini was just the first of a flood of new companies founded on the island between the wars. 1923 saw the appearance of Studio Ars Labor Industrie Riunite. In 1932, A.VE.M (Arte Vetraria Muranese) appeared, followed by Seguso Vetri d'Arte in 1933. The world of Murano glass was an incestuous one, with glass makers frequently resigning from one company to set up on their own, leaving an immensely confusing collection of firms, often more than one bearing the name of the original glass maker. Between the wars, Murano still traded on the traditional took of Venetian glass, using old techniques like 'Fenicio'. With this method, a coloured glass spiral applied to a vase is combed with a sharp tool to create something approaching a herringbone effect. 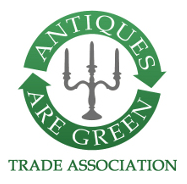 In terms of form, the factories often made classic amphora-shaped vases and urns with handles. 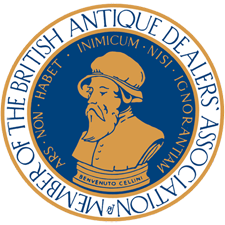 "Past eras were sifted through again and again to embellish the banal and seduce the weary customer" explained glass historian, Mark Cousins. In the 1930s, heavy globular art glass appeared. A wide range of finishes were developed, such as the corroso technique of coating the glass with chemicals and then dunking it in acid to create a rough surface. Paulo Venini introduced 'vetro battuto' or 'beaten glass' with tiny indentations to the surface, 'vetro pulegoso' or 'bubbled glass', and 'vetro tessuto', glass with vertical threads of white or coloured glass. Although new glass companies sprang up on the island in the 1920s and '30s, Murano was just one of many glassmaking centres in the world. Orrefors and the other Scandinavian factories with their overtly modernist designs were outpacing the Italians. The Murano companies were working under a fascist state. In that atmosphere it was difficult to introduce self-consciously modernist ideas under a regime which thought of modernism as degenerate. It took the Second World War to shake the last vestiges of traditionalism out of the glassworks. The new art glass that rose from the ashes in the late 1940s marked a break with the past. 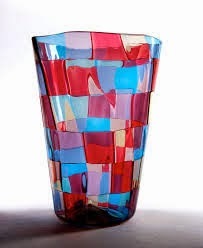 The Murano companies introduced strong colours into their glass - with often garish, technicolour results. As Murano expert, Marc Heiremans, explains: "The main characteristics of the 1950s are undoubtedly a daring multiplicity of colours, forms and decorations influenced by modern art and, above all, a continuous technical renewal". At first, the bright and breezy colours were too much for the depressed export market (the majority of Murano had been sold abroad). In the 1950s, the new 'Murano' look began to reach a fresh young clientele who yearned for clean lines for a new post-war era. 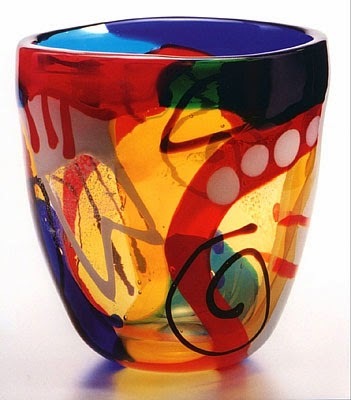 Murano reached its peak in the 1950s and early 1960s with great quantities of the glass sold around the world. Top designers were brought in to create the new look. At Venini, Gio Ponti and Fulvio Bianconi brought new ideas into the Murano glass industry. Most famously, Bianconi invented the 'handkerchief vase' which looks like a cupped glass handkerchief. Original 1950s' handkerchief vases regularly appear at auction and can make anything from £100 upwards depending on their size and quality. The variations on the basic handkerchief vase included a plethora of striations and decorative lines on the handkerchiefs, and the more unusual the decoration the more attractive they are to collectors. harlequin built up from blobs of different colored glass. 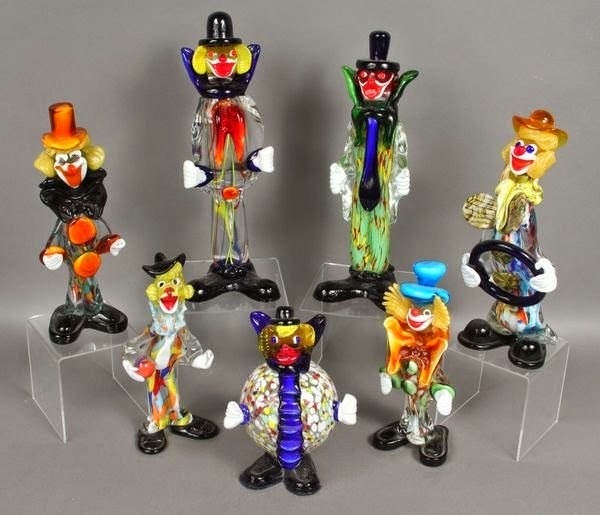 The most valuable are the designer-made clowns from the 1950s which can fetch upwards of $500- £300 at auction. These were more closely modelled on the human form, without the exaggerated figures of the later clowns, and came in more subdued shades. 'stripey' motif was prevalent. Typical of this style, a good Barovier e Toso mezza filigrana vase sold in Sydney in May for A$747_50 (around £300). With Barovier e Toso and Venini leading the field, together with the lesser- known Murano companies, the Italian art glass industry ballooned. The labour intensive nature of art glass has in the last twenty years reduced the Murano glass industry to a shadow of its former self. While the middle class homeowner of the 1950s could afford a piece of Murano glass without too much trouble, today's middle classes are as likely to collect the older 1950s' pieces than buy new works. The costs of handcrafting glass in the *6os and '70s prompted the larger glass companies to shy away from the complex glass forms and turn to a more functionalist style. The whole concept of 'design' had become rather elitist. While today good design is back in fashion, the glass works are only producing a fraction of the output in their heyday. 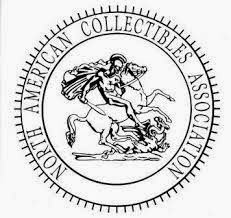 All of which makes collecting Murano a sensible bet.